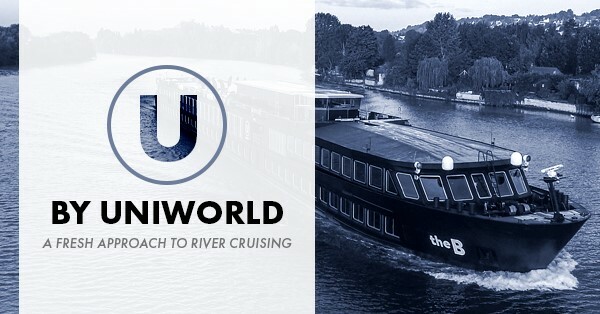 U by Uniworld is a new take on experiential travel, with cruises designed for those with a passion for exploring and a taste for authentic adventures. We at U have always believed that travel should be relaxing, exhilarating, convenient and tailored to your interests — all at the same time. And on a U by Uniworld river cruise, that’s exactly what you’ll experience. Onboard, you can expect everything you’d find in your favorite boutique hotel. But here’s the best part. Your floating boutique hotel makes it extra-easy to visit several European destinations in a single trip while only having to unpack once..
Rates are per person, land only, Click link to see cruise description. All rates include gratuity. Tax is $160 per person. Please check with your favorite agent or email us for latest availability. · How many people are on each cruise? · Each ship has a max capacity of 120 passengers (pax). · What accommodation options are there? · Is the trip all inclusive? · Two meals onboard per day and select non-alcoholic drinks such as complimentary water, coffee and tea all day long, as well as complimentary juice during breakfast. Included meals are usually brunch and dinner, as most guests will be out and about during the day. · Select shore excursions – We offer one included shore excursion per day, specially tailored for U guests. · Gratuities – All gratuities for onboard and shore excursions are included. · Onboard entertainment and select activities – Including activities like our Local DJ Night and Welcome Party. · Are Port Charges included in published fares? · In the United States, South Africa and South America – the published pricing does not include port charges. In Australia, New Zealand, Canada and the United Kingdom – the published pricing is inclusive of port charges. · Are Gratuities included in published fares? · Yes, gratuities for onboard and shore excursions are included in the published fares. · Are Transfers to/from the ships included in published fares? · No, transfers are not included in the fares; however, we will offer both group and private transfers for an additional fee. · Will there be bikes on board? · Yes, each ship has 50 U Bikes onboard for complimentary use for our guests. · Will there be a gym on board? · Yes, each ship will have a sizable fitness center onboard – inclusive of aerobic machines, weights and yoga mats. Complimentary Yoga and TRX classes will also be offered to our guests. · Are the movies in the bedrooms included or will guests need to pay extra? · Yes, there will be movies available for rent in the bedrooms; however, the rental price has not been set at this time. · Yes, complimentary Wi-Fi is included throughout the ship. We also offer personal hotspots for rent during the cruise which can be used onboard and on shore. The rental price is 8 euros per day. · How much money should a guest plan to spend each day above and beyond the cruise fare? · Food – Two onboard meals are included each day; however, guests may choose to have any meal on shore at their own expense. · Drinks – Guests can also enjoy complimentary water, coffee and tea all day long, as well as complimentary juice during breakfast. All other drinks, including alcoholic beverages, will be at an additional charge. · Excursions – Our U Time excursions range in price depending on the activity, and participation is completely optional. Dine: The main restaurant on the Downstairs deck – serves brunch and dinner. Meals in the restaurant are included in the cruise fare, change daily and feature a range of locally-inspired and farm-to-table dishes, including vegetarian and vegan options. U Lounge: The always-open lounge on the Upstairs deck – serves tapas-style sharing plates and after-hours snacks. Are there set dining times in the restaurant? On most days the restaurant will be open for brunch and dinner, with a range of open hours for each dining period (i.e. 9am-12pm). Guests are welcome to eat any time within the open hours, which will be published onboard. The restaurant is open seating, with a combination of communal tables, high tables and small tables – allowing guests to change their dining companions each day as they meet new friends, or join the same group time after time. The bar is open during the day and late into the evening. What is the legal drinking age onboard? The legal drinking age onboard is 21 years old. Can guests bring alcohol onboard and consume it? While we allow guests to bring alcohol they’ve purchased in port and through shore excursions onboard, these beverages should not be consumed onboard and we reserve the right to prohibit and retain all alcohol bought ashore for consumption onboard the vessel.